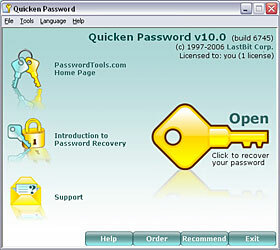 There are two types of passwords used in Quicken: a password for opening a data file (also known as 'file password') and a transaction password. If both passwords are set, you will have to find the password for opening the file first; then you can recover the transaction password. In other words you cannot recover the transaction password if the file password is set. It is possible to break the transaction password instantly. Fake Password will be constructed. Unless your document was created in an old Quicken (prior 2001), the password for opening is much, much harder to break. The universal recovery methods (Brute Force Attack, Dictionary Search and Smart Force Attack) must be used for that. Unfortunately, even a single password check takes a lot of computations, so the search speed will be very slow (not more than 1000 passwords per second). This means that the recovery of even a relatively short password will take A LOT of time. Use our Password Calculator to estimate the recovery time. As of today, all our competitors offer a demo version that recovers short passwords. However, the recovery of longer passwords takes unacceptable amount of time. This means, one may try a demo version, find out that it works properly (on short passwords! ), then buy the program's full version and find out that it is useless. Are you ready to spend four months waiting until your 7-character password is recovered? In other words, this means that you can easily waste your time and money and get absolutely nothing in return! LastBit Corp. proudly presents Guaranteed Recovery Service for Quicken. We will spend 24 hours trying to break a password to your Quicken document. Since we will use the power of multiple computers, this will be equal to spending 6+ months of computations on a single computer. This does NOT guarantee the success; however, it significantly improves your chances. Most important - we will not charge you even a single penny if we find that we cannot recover your password. Guaranteed Recovery service for one Quicken document is included into the program. 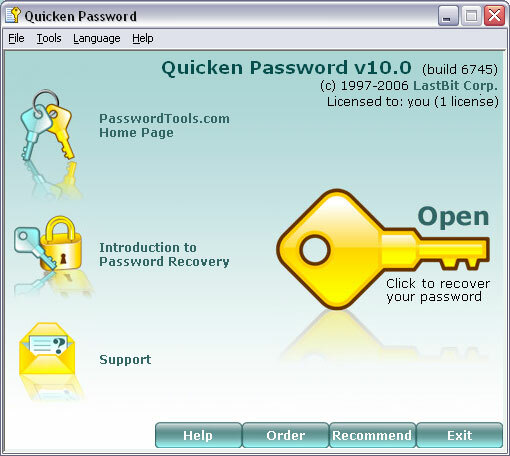 If you need to recover more Quicken documents you need to purchase additional licenses of Quicken Password. In order to use the Guaranteed Recovery Service, download and install the demo version. Run the program and select the password-protected Quicken file. You will be asked to select the recovery method. Choose "Fast Recovery Service" and then click OK. Quicken Password will send the recovery request to us. We will check if we can recover the password and send you the confirmation. Then you can buy the program and get the password. If we cannot recover the password, you have no obligation to buy the software.